Box Text: Affordable Space Adventures is a stealth puzzle spaceship simulator. Control your craft solo or in a crew of up to three players. The Wii U GamePad™ is your Heads Down Display and gives you precise control over all the internal systems of the ship. Tweak the thrusters, antigravity, stabilizer and many more systems in order to successfully navigate a hostile planet and sneak past alien robots. Explosions, engine shutdowns, blown fuses and implosions may occur. This is a list of VGCollect users who have Affordable Space Adventures in their Collection. 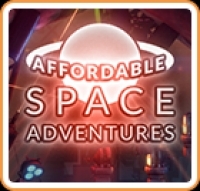 This is a list of VGCollect users who have Affordable Space Adventures in their Sell List. This is a list of VGCollect users who have Affordable Space Adventures in their Wish List.